This little town was used as a staging area for the Army in World War I. Campobello, formerly known as Campobella, has a long and rich history. It has never been a town with too many people, and today the population stands at 521. Many of the buildings that are in Campobello today hold historical significance to the town, such as the town’s first fire and police department, the town’s first post office, and more. Campobello is part of Spartanburg county, giving Campobello plenty of opportunities for work, school, and play. The city of Spartanburg is about 30 minutes away and Greenville is about 45 minutes away. Campobello is 15 minutes away from Lake Bowen and Lake Cooley, and 25 minutes from Lake Robinson. It is also 15 minutes away from Hollywild Animal Park. If you’re looking for something more educational, you could visit Cowpens National Battlefield, the Spartanburg Art Museum, The Peace Center, the Chapman Cultural Center, and so much more, all within a 45-minute drive. Campobello offers something for everyone. If it’s not in the Campobello area directly, it’s in the towns and cities surrounding it. For that small town feel with a convenient commute time to work, school, or play, there are plenty of Campobello homes for sale to fit everybody. Campobello is part of Spartanburg county school district 1, which is ranked in the top 10 for multiple categories against other districts in the state such as best place to teach, best sports, best facilities, and more. For secondary education, there are numerous nationally recognized and accredited colleges and universities within a 25-mile radius. Spartanburg county is an ever-growing hub of work opportunities in every field. There’s construction, administration, manufacturing, law enforcement, environment, and much more. There is something for everyone. Just like there are jobs, events, and activities for everyone, there are also plenty of homes for sale that fit everyone. Regardless of wallet or family size, or style preference, Campobello has something to fit every need and desire. 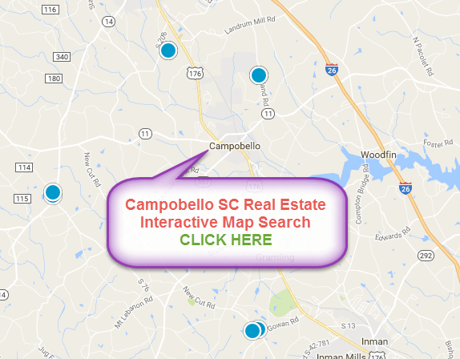 If you're looking to buy or sell a home in the Campobello area, contact the PRODUCER Realty expert real estate team at 864-438-5050.